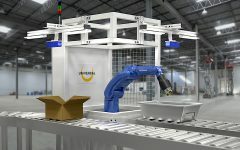 Universal Logic has received an order for 60 robot cells using its Neocortex Goods-to-Robot technology, which applies artificial intelligence to consumer order fulfillment. Commercial uses of UAVs and other autonomous systems will generate a lot of data, noted Intel executives at AUVSI Xponential. Intel drones are part of the company's efforts to provide end-to-end solutions for industrial applications. Unmanned aerial systems are growing in popularity among emergency responders and law enforcement authorities. Will privacy concerns and rules about police drones be enough to slow adoption? Robotics integrators provide customized services to help businesses prepare for, set up, and maintain their industrial automation. More sophisticated programming and easier to use cobots aren't a threat to integrators but rather part of a widening market opportunity. Mobile Industrial Robots' MiR200 is designed to be safe, easy to use, and flexible. The company's rapid growth over the past year indicates the market's hunger for mobile robots, and end-user cases demonstrate its response to that hunger. At a RoboBusiness Europe 2017 keynote, Fetch Robotics CEO Melonee Wise discussed why commercial robotics is growing so fast now and what designers need to remember about end users.